This is a call for change. We are called apart and are a special, holy people. Our lives must reflect this special calling. 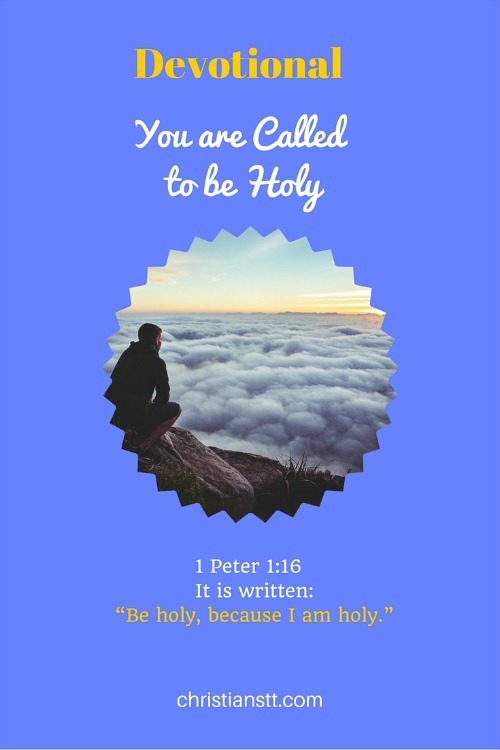 You are called to be holy. Lift up your eyes to the Lord and glorify His name. Let us give thanks for the privilege to be called sons of God. This day, let us be an example to all, so that they may see Christ in us. As true ambassadors of Christ, we should be proclaiming the good news of the Kingdom. This we should be doing daily in the way we live our lives. It is not a Sunday event. It’s a daily walk with Jesus. As you travel to work, partake of lunch, or work diligently today, do it as unto the Lord. You may think no one notices or no one cares, but you would be surprised. Give praise throughout the day, even when things don’t seem to be going your way. Spend some time in studying the Word and those who try to rile you…. just pray for them, and smile. God’s blessings upon your life are bountiful today! Have a great day and a blessed night!